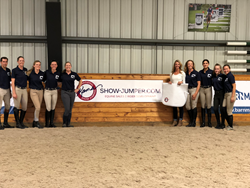 This was such a great opportunity and we can’t thank Laura, Barn Manager, and WIHS enough for making this clinic possible. On Tuesday, August 14, Team Kama welcomed U.S. Olympic Team Bronze Medalist Laura Graves to their training barn at Ohana Equestrian Preserve for a special clinic as grand prize for winning the 2017 Washington International Horse Show Barn Night Video Contest. In 2007 she started her own international equine sales business: Kama Godek, LLC where she helps International customers find European horses. Many horses which she has produced and shown have been sold to leaders in the equestrian industry including Paul Schockemohle, Scott Stewart, Andre Dignelli, Devin Ryan, The Ehnings and Dahlma Malhas (the first female Saudi to show internationally). She has spent over a decade teaching and showing in Europe and obtained a German Trainers certification from the Westfalian Rider and Driving School in Münster Germany. Her extensive knowledge comes from growing up around horses and working with former Olympians and top international riders Laura Kraut and Katie Prudent. Originally from Fairfax Station, Virginia, Kama Godek is a graduate from the College of Charleston with a focus on international markets. She currently operates out of Ohana Equestrian Preserve in Aldie, Virginia and at independent facilities in Wellington and Ocala, Florida.